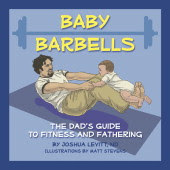 Moments: Book Review - "Baby Barbells"
"Baby Barbells: the Dad's Guide to Fitness and Fathering" written by Joshua Levitt, ND is a wonderful book! This would make a great gift for all new dads! Once a man becomes a dad, his entire world has changed! This book shares tips for staying in shape physically and emotionally, building a bond with the baby and supporting the baby's money. This book is designed in a way that it is straight-forward and easy to read, filled with diagrams, charts and pictures and is enjoyable for everyone to read. Different aspects are addressed such as abs, down time, bonding with the baby and mother and balancing family and work. This book is the best fathering book I have seen!